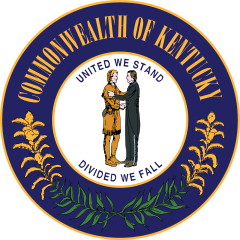 Hart County is a county located in the Commonwealth of Kentucky. As of the 2010 census, the population was 18,199. Its county seat is Munfordville. Hart County is a prohibition or dry county. Hart County was formed in 1819 from portions of Hardin and Barren counties. 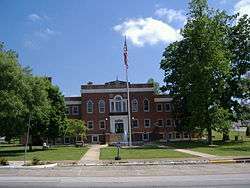 The county is named for Captain Nathaniel G. S. Hart, a Kentucky militia officer in the War of 1812 who was wounded at the Battle of Frenchtown and died in the Massacre of the River Raisin. The Battle of Munfordville, a Confederate victory, was fought in the county in 1862, during the American Civil War. A courthouse fire in January, 1928 resulted in the loss of some county records. According to the U.S. Census Bureau, the county has a total area of 418 square miles (1,080 km2), of which 412 square miles (1,070 km2) is land and 5.8 square miles (15 km2) (1.4%) is water. A female wolf shot in 2013 in Hart County by a hunter was the first gray wolf seen in Kentucky in modern times. A portion of Mammoth Cave National Park and the cave for which it is named is located in western Hart County. As of the census of 2000, there were 17,445 people, 6,769 households, and 4,812 families residing in the county. The population density was 42 per square mile (16/km2). There were 8,045 housing units at an average density of 19 per square mile (7.3/km2). The racial makeup of the county was 92.58% White, 6.20% Black or African American, 0.22% Native American, 0.11% Asian, 0.03% Pacific Islander, 0.18% from other races, and 0.69% from two or more races. 0.86% of the population were Hispanic or Latino of any race. There were 6,769 households out of which 32.60% had children under the age of 18 living with them, 56.80% were married couples living together, 10.40% had a female householder with no husband present, and 28.90% were non-families. 25.30% of all households were made up of individuals and 12.00% had someone living alone who was 65 years of age or older. The average household size was 2.54 and the average family size was 3.05. In the county the population was spread out with 25.70% under the age of 18, 8.60% from 18 to 24, 28.20% from 25 to 44, 23.50% from 45 to 64, and 13.90% who were 65 years of age or older. The median age was 37 years. For every 100 females there were 96.90 males. For every 100 females age 18 and over, there were 93.20 males. The median income for a household in the county was $25,378, and the median income for a family was $31,746. Males had a median income of $26,994 versus $19,418 for females. The per capita income for the county was $13,495. About 18.60% of families and 22.40% of the population were below the poverty line, including 28.40% of those under age 18 and 22.00% of those age 65 or over. James Greene Hardy Local politician of the 1850s, was Lt. Gov. of Kentucky. 1 2 "State & County QuickFacts". United States Census Bureau. Retrieved March 8, 2014. ↑ Rennick, Robert M. (1987). Kentucky Place Names. University Press of Kentucky. p. 133. Retrieved 2013-04-28. ↑ The Register of the Kentucky State Historical Society, Volume 1. Kentucky State Historical Society. 1903. p. 35. ↑ Gannett, Henry (1905). The Origin of Certain Place Names in the United States. Govt. Print. Off. p. 151. ↑ Hogan, Roseann Reinemuth (1992). Kentucky Ancestry: A Guide to Genealogical and Historical Research. Ancestry Publishing. p. 249. Retrieved 26 July 2013. ↑ "2010 Census Gazetteer Files". United States Census Bureau. August 22, 2012. Retrieved August 16, 2014. ↑ Russ McSpadden (August 19, 2013). "Wild Wolf in Kentucky, First in 150 Years, Killed by Hunter". Earth First! News. Retrieved September 4, 2013. ↑ "U.S. Decennial Census". United States Census Bureau. Retrieved August 16, 2014. ↑ "Historical Census Browser". University of Virginia Library. Retrieved August 16, 2014. ↑ "Population of Counties by Decennial Census: 1900 to 1990". United States Census Bureau. Retrieved August 16, 2014. ↑ "Census 2000 PHC-T-4. Ranking Tables for Counties: 1990 and 2000" (PDF). United States Census Bureau. Retrieved August 16, 2014.